Researchers at Princeton University consulted models and observations of an extreme thunderstorm that hit Baltimore in July 2004 and found that about 30 percent more rainfall occurred in the city than would have if there were no buildings where the city now sits. During the storm, Baltimore experienced as many lightning strikes in the space of two hours as the city normally sees in a whole year, with much of the lightning striking the western edges of the city. Heat Effect: Cities create their own heat, replicating the impact of global warming. Wind Drag: Tall buildings create their own wind effect. Aerosols: Tiny particles suspended in the air over cities emitted by vehicles and industry. 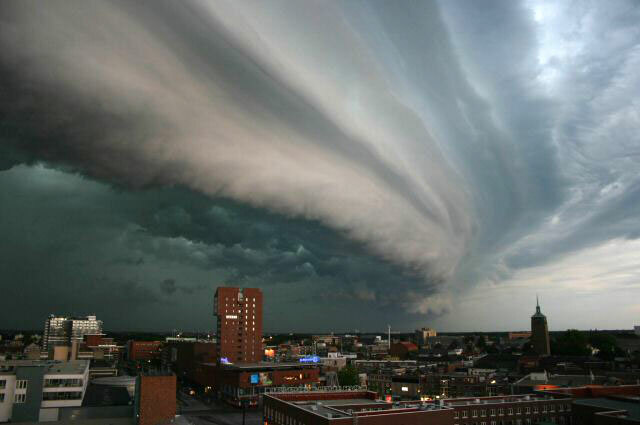 This apparent interaction between storm and city has critical consequences for city dwellers and policymakers, especially in light of the likelihood of such fierce storms becoming more common with the influence of global warming (as warmer air holds more water, which means more intense rainfall in any given storm). "This means that warm-season thunderstorm systems will probably increasingly lead to more flash flooding, which can be very dangerous," said study co-author James Smith, of Princeton. Which means the tornado that touched down in Brooklyn the other day was not only not a coincidence, but that we can expect more of the same in the future.Here's a link to the MSNBC report on the Princeton Study.